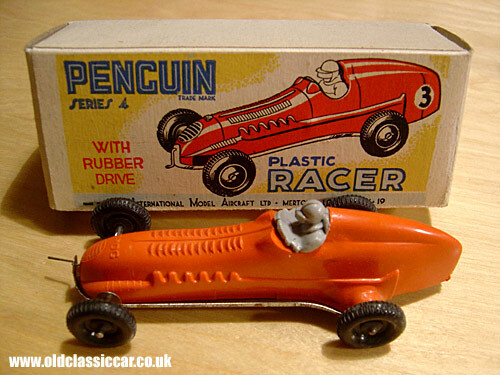 The "Penguin" Plastic Toy Racer. Two racing cars powered by rubber bands. These two wind-up toy racing cars were sold under the "Penguin" brand name. These were actually produced by the company better known for their rubber-band-powered "FROG" aeroplane models, namely International Model Aircraft Ltd, of Merton in London. 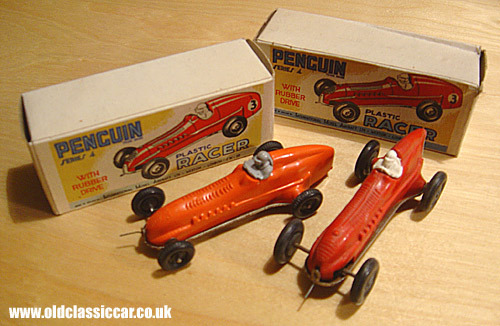 Both of the Penguin racing cars shown come with their original boxes, and date to the 1950s. The cars measure 4.5 inches in length. The upper (removable) bodywork is made in very lightweight plastic, and the base in tin. The idea was that you remove the bodywork and fit a small elastic band inside, connecting the 'starting handle' at the front, to the simple differential at the rear. Refit the body, wind the handle, and away the car went. The writing on the box advises that: "This is the first of a series of PENGUIN Models propelled by the special RUBBER DRIVE. Watch for further announcements of this new range. 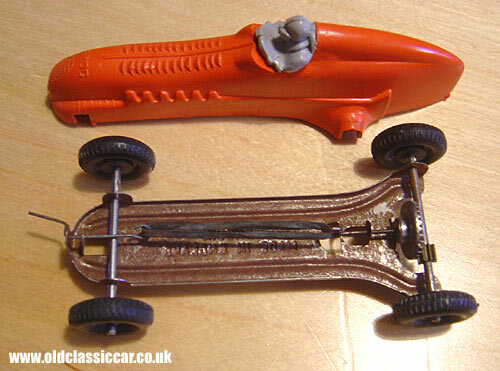 This FROG super detailed plastic model of a Maserati racing car incorporates several entirely new features. Although it is a fully mechanical toy, all the troubles associated with other types of miniature motors have been completely eliminated by the use of a simple rubber band for motive power. The method of winding, using the starting handle, is unique, and the crownwheel and pinion power transmission to the rear wheels is based on full-size car principles. The life of the mechanism is virtuallu indefinite - it is only necessary to replace the rubber band when it breaks". One of the cars shown has the name FROG above the Maserati's grille, the other doesn't for some reason. I'd be interested to know what other band-powered toy cars were also built under the Penguin name.